A post I published in July titled “Why so many kids can’t sit still in school today” seems to have struck a nerve with readers, who continue to read it in big numbers. The piece was by Angela Hanscom, a pediatric occupational therapist, who said that kids are being forced to sit for too long while they are in school and are being deprived of enough time for real physical activity. This, she said, is affecting their ability to learn and in some cases leading to improper ADHD diagnoses. Here is a follow-up post by Hanscom in which she talks about how to get kids moving in class and some of the mistakes teachers are making. Some of her suggestions may be controversial. 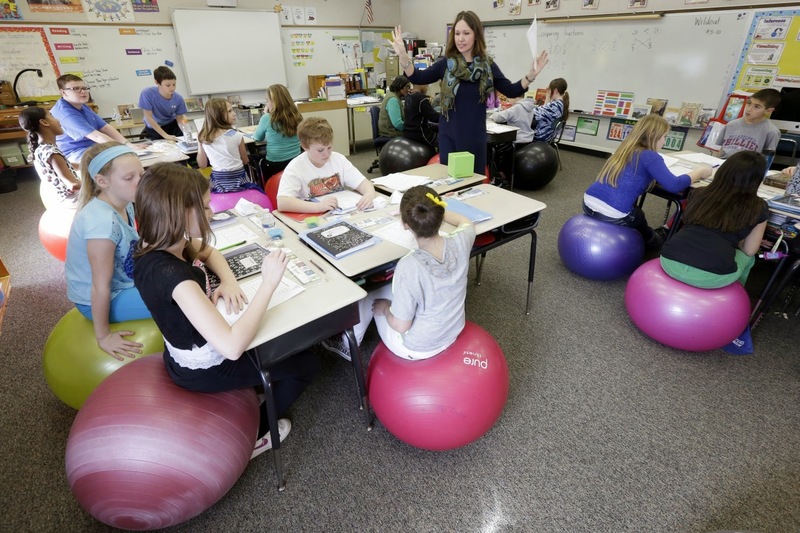 For example, she takes issue with a method that some teachers say they are using with success — having students sit on bouncy balls. Hanscom is the founder of TimberNook, a nature-based development program designed to foster creativity and independent play outdoors in New England. My initial reaction to these brainstorming sessions was, Finally! People are inspired and are starting to think outside the box. However, as I recalled why I wrote the article in the first place, I realized these strategies were still partly missing the point. They may be creative and thoughtful, but they won’t fix the underlying problem. In other words, adjusting children’s seating and taking quick one-minute movement breaks will offer some support — but we will continue to see significant sensory and behavioral problems, as well as a decline in children’s overall health (i.e., rise in obesity, decrease strength, and poor body awareness) if we don’t start allowing for adequate time in which children can get up and out of their seats to move. Recently, I was invited to an educational meeting regarding a first-grade boy whom I see as a private occupational therapy client. The principal, parents, his former kindergarten teacher, new first grade teacher, school psychologist, and private therapist were all there. This little boy struggles with attention in the classroom and making social connections with peers. This same boy attended one of our TimberNook camps (developmental nature programming) this past summer. He was totally immersed into nature for a week with peers—playing in the woods, the river, and in giant mud puddles. He had plenty of practice to move his body in all different directions and to explore nature unhindered by adult fears. In the beginning of the week, he consistently pursued total control over his play experiences with peers. He was also very anxious about trying new things, had trouble playing independently, and had multiple sensory issues. Amazingly, by the end of the week, he started to let go of this need to control all social situations. He also started tolerating and asking to go barefoot, made new friends, and became less anxious with new experiences. The changes were really quite remarkable. All he needed was time and practice to play with peers in the woods – in order to foster his emotional, physical, and social development. Most of these teachers had already read my article about why kids fidget and agree with this philosophy. It didn’t matter. When they heard my response, they started laughing – all of them. I think my face went bright red. “That is never going to happen,” said one of the teachers. “Yes,” agreed another teacher. “Unfortunately, our hands our tied.” The principal just sat there and said nothing at all. That’s it? I thought to myself. They know that children NEED this, but they aren’t going to do anything about it? I started talking to other teachers about this same issue. Most teachers are just as frustrated, if not more than the parents. Secondary to testing requirements, teachers are feeling the pressure to have to fit in loads of curriculum everyday. They have little time to do project-based learning, let alone providing adequate time for children to move. Unfortunately, many teachers have to settle for fitting in a few minutes of movement here and there. However, when do we draw the line? When do we say, “Enough is enough?” Shortened recess times, cutting gym classes, and other specials (i.e., music and art) means we are no longer respecting the needs of thewhole child. Our system of testing is failing our children. It fails to test their social skills, their ability to think for themselves, and their physical skills (i.e., strength, endurance, coordination). Aren’t these just as important as their ability to read, write, and do arithmetic? We need to be careful not to put total emphasis on just a few subjects, while neglecting children’s other needs. I agree with Lindsey. We CAN create more time for children to move during the school day. Saying, “our hands are tied” is just about as bad as a child saying, “I can’t.” Let’s not give up the fight before we even start. We had ample time to move and play during the school day when I was a child in the early 1980s, and we can figure out how to do it again.